Now let's talk about the new S-Pen features. You'll find pretty much every S-Pen-enabled app that premiered with the previous Notes pre-installed on the Note 3. But once you pull the S-Pen out, you won't be greeted with the old S-Pen dedicated home pane. Instead, the OS will pop up the new Air Command menu. The new menu is available everywhere throughout the UI too, you just need to press the side button on the S-Pen. The Air Command menu is a virtual ring with five shortcuts - Action Memo, Scrap Booker, Screen Write, S Finder and Pen Window. The Action Memo lets you write stuff and then use it to initiate an action - i.e. add a contact name and number to your phonebook, or check out an address on Google Maps. You just need to mark a part of the text and send it to one of the supporting apps. The handwriting recognition works impressively fast and accurately - it handles just about everything you throw at it. Scrap Booker lets you add pieces of your screen to... well, a Scrapbook. You don't need to take a full screenshot - just mark the stuff you need. The Scrap Booker will automatically extract pictures and text from the selected area and will save them to one of your Scrapbook categories. You can then add an optional memo to every scrapbook entry you create. Screen Write allows you to start writing on the display no matter what screen you are on. You can either use a clean sheet or use a snapshot of the screen you are currently using. It's the best tool for taking quick memos. The S-Search is a local search that'll browse through all the content on your Note 3 with preset filters. It can search in all S-Pen content you've added (including notes, scrapbook pages, etc. ), messages, multimedia, settings, phonebook, even the internet. Naturally, all handwritten stuff is an easy job for the S-Search. You can even search for symbols you've drawn with the S-Pen. That last one seems to work quite slowly, however, and unless you actually use the scrapbook quite a lot you probably won't need it that often. The last element of the Air Command menu is Pen Window. It lets you launch a mini window with one of the supported apps by drawing a rectangle on the screen. The Galaxy Note 3 will then fit the floating app in said rectangle (correcting the aspect, of course). Here is a demo video showing how these new Air Commands work. S Note is an application that allows you to create and customize notebooks. There is a total of 9 preset notebooks to choose from but you can also create your own custom look from images in your gallery. After you're done creating a notebook you can go ahead and fill it with notes, drawings, images on which you can draw or doodle, etc. The app gives you a nice little preview of the notes inside a notebook when you swipe it down in the main window. Inside a note you can choose from a variety of pens and brushes, adjust the color and thickness of the line, insert text in a number of fonts, make the text bold or italic, etc. You can create custom shapes, have an undo and redo option and choose to delete whole lines or just parts of the content. You can insert just about anything into a note - voice memos, images, video, charts or illustrations, maps, etc. Scrapbook lets you keep any content you browse through on the Note 3's screen. You need to select anything on the screen of the Note 3 by pressing the S Pen button and the software highlights it and gives you a prompt to send it to Scrapbook via an image. Air Command also gives you a shortcut to Scrapbook and lets you highlight anything on screen. You can also add notes to a scrapped image as well as tags. The app lets you import images from your phone or SD card storage and sync with your Samsung account but to our disappointment won't let you sync your scraps and tags to Evernote, Springpad, Google Keep, or any other third party app. 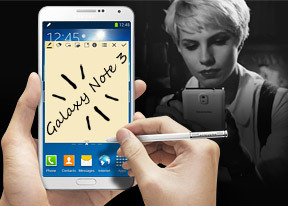 The Samsung Galaxy Note 3 comes with a number of other advanced features enabled by the powerful hardware and dedicated sensors. The first is Air View, which debuted on the Galaxy Note II and worked with the S Pen. Just like before when you're hovering the S Pen or finger over text or image, email, the software responds and brings you a larger pop up version of it. This is called information preview (e.g. SMS text, calendar entry text and so on). It also works for previewing videos just by pointing to a spot in the timeline, and it lets you checking out the next track in the music player by hovering over the next button (available with the previous button too). There's also the use for for previewing folders, speed dial contacts, and magnifying links in web pages. Air view detects fingers or the S Pen around 3cm away from the screen, so there's no danger of accidentally tapping the screen when you wanted to use Air View instead. Another set of "air" features are the Air Gestures. Quick Glance is one of them, but there's more. The rest of the air commands are triggered by waving your hand over the Galaxy Note 3. You can use waving to scroll web pages in the browser (vertical waves), switch between tabs (horizontal waves), move between tracks in the music player and photos in the gallery, accept a call and move app shortcuts and S Planner events. Air Gestures can detect your hand up to 7cm away from the screen (just under 3") and might prove useful in some situations. Note that only the native apps support those, third party ones are a no-go (even Chrome that comes preinstalled on the phone). Smart Scroll is yet another feature that leverages on the front-facing camera - it allows you to scroll up and down by tilting the phone or by tilting your head. It's a bit hard to get used to it initially, but once you do it's rather useful for certain scenarios - particularly when your other hand is busy. The final Samsung-exclusive feature is dubbed Smart Pause. While watching a video, it uses the front-facing camera to track your face and will automatically pause the video when you look away. Look back and the screen and the playback continues. Then there are a number of motion gestures, which are not exactly new. There's direct call (dial the contact currently displayed on the screen by lifting the phone up to your ear), smart alert (makes the phone vibrate when you pick it up if there are missed events), zooming and panning in the gallery, a shake of the phone to refresh the list of Bluetooth devices and muting alarms or pausing music playback by putting the phone face down. S Voice is Samsung's answer to Apple's Siri and is present on the Galaxy Note 3. S Voice can be used to initiate a call, dictate text, play music, open an app, change a setting, make a memo (including voice memo), add a reminder, schedule an event, set an alarm or timer, check the weather, do a search on the internet, look for local listings (e.g. nearby restaurants) and even get an answer to a question. S Voice does duplicate parts of Google Now, but being less search focused it tries to do more on the actual phone and it has some added features. Some of these are available outside of S Voice too, so you can set the Galaxy Note 3 to answer a call, snooze an alarm, take a photo and what not by voice commands even when S Voice isn't running. The only problem with S Voice is not nearly as fast or as accurate at recognizing your speech input as Google Now. Naturally, being a Jelly Bean smartphone, the Galaxy Note 3 also comes with Google Now.